Our physical and occupational therapists use technology to help patients practice and repeat important functional movements—such as pushing, pulling, grasping, stretching and turning. This helps children become stronger, develop better coordination and demonstrate skills they couldn’t perform before. Spina bifida patient Mike Heininger is making great strides with our advanced technology. We use a wide range of advanced technologies as part of the overall treatment strategy for our patients. 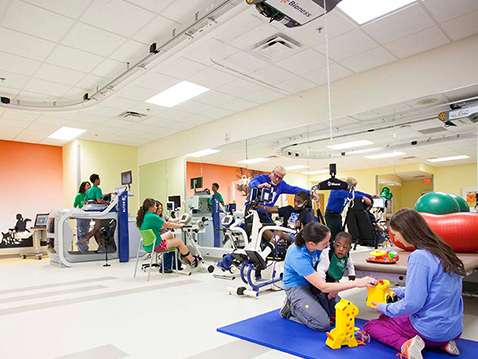 The center provides a full continuum of care to children and teens in both inpatient and outpatient settings. Therapists can use computers and sensor controls to direct and pace your child’s movements. The technology also promotes motor learning by tracking your child’s response and providing biofeedback. Biofeedback is a process that electronically monitors what is normally an automatic movement, which trains a patient to gain voluntary control of that movement. Our therapists also incorporate games to keep children entertained and motivated, which can help them achieve the best recovery outcomes possible. 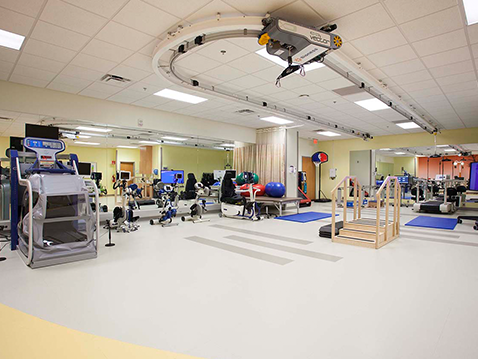 Our center uses a wide range of equipment for occupational and physical therapy. The center’s therapists and doctors have thoroughly researched each piece of equipment to ensure it meets the needs of our patients. Team members will create an individualized treatment plan that incorporates a variety of equipment to address your child’s condition. 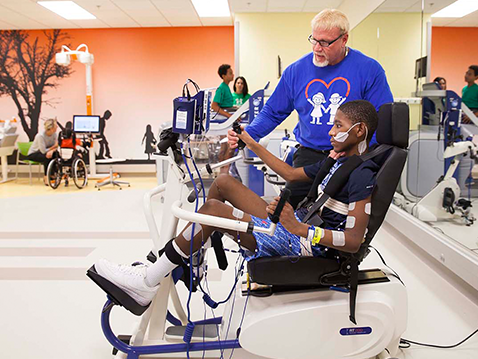 As he progresses through therapy and regains strength and function, we’ll introduce new equipment and exercises to assure he continues to improve. 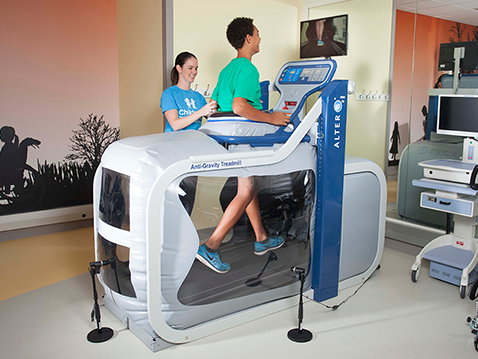 AlterG Anti-Gravity Treadmill: This advanced treadmill supports and lifts your child during exercise to reduce stress on his joints and muscles. Andago: This gait trainer supports your child's body weight as he practices stepping and balancing while moving safely on a variety of different surfaces. Bioness H200 Wireless Hand Rehabilitation System: This device delivers low-level electrical stimulation to activate the nerves that control the muscles in the hand and forearm, allowing your child to move his fingers and thumb. Bioness L300 and L300 Plus: These leg cuffs stimulate your child’s thigh or lower leg muscles and keep him from losing muscle or having spasms. Bioness Integrated Therapy System: This touch-screen technology improves your child’s vision, motor control, balance and speech. The system also keeps track of your child’s progress in these areas. 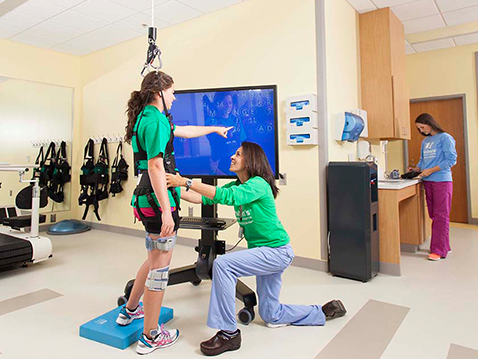 Bioness Vector: This harness training system, which is attached to the ceiling, physically supports your child as he practices walking or balancing on flat or uneven surfaces, including stairs, the ground or a treadmill. Ekso Robotic Exoskeleton: This exoskeletal-assisted walking device uses electronic motors and sensors to help your child stand and take steps more easily. 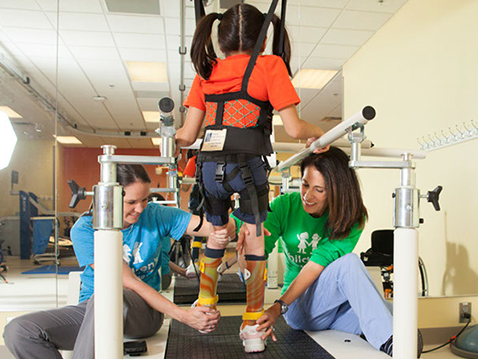 With the help of this device, your child can walk while using good form. The Ekso Robotic Exoskeleton can fit patients from 5 feet to 6 feet 2 inches tall. Galileo Training Platform: By vibrating your child’s arm or leg muscles, this equipment can strengthen his muscles and improve balance, as well as reduce spasticity. 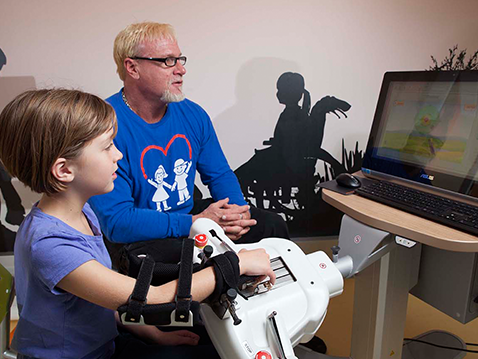 Motomed Gracile: This biking system, equipped with a computerized gaming system, is specifically designed to rehabilitate your child’s arms and legs. In addition, the system uses electrical currents to help stimulate your child’s nerves. RT200 and RT300: These biking systems use repetition and feedback to develop your child’s arm and leg functions, as well as stimulate nerves using electrical currents. RT600: This device support’s your child’s bodyweight as he practices walking or standing. It provides biofeedback and uses electrical currents to help stimulate nerves as your child stands upright. SaeboMAS: This device supports your child’s shoulder and elbow and unweights his arm so he can practice functional skills, such as reaching or moving and carrying objects. Tyromotion AMADEO: This robotic device helps your child with hand and finger movements. In addition, it can help build strength with different grasping techniques. Tyromotion DIEGO: This arm system helps your child build function and independence with daily tasks, and it provides feedback. The equipment lets your child strengthen one or both arms at the same time. Tyrostation (Pablo and Tymo): This equipment allows your child to work on his grip strength and forearm movement while training multiple upper-extremity joints. Additionally, the Tymo allows your child to work on balance and posture control. Intensive therapy is a more concentrated form of physical, occupational or speech therapy that can benefit children and teens recovering from injuries or disorders that have affected their motor skills. Therapists use the latest technology to help children build strength and coordination with exercise and repetition over a shorter period of time than regular therapy. Call Erin Eggebrecht at 404-785-5829 for more information. 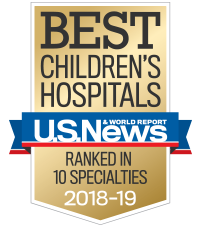 Children’s is often among the first hospitals to try emerging technologies to offer our patients the best possible care. 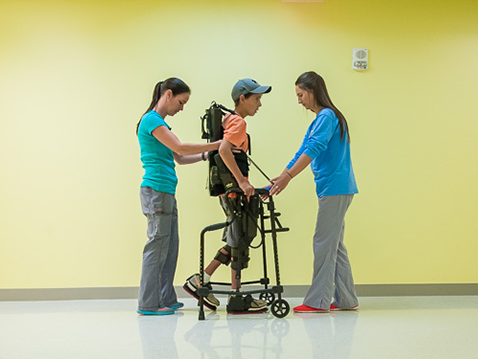 For instance, we’re the first pediatric hospital in the nation to offer the Ekso Robotic Exoskeleton, an exoskeletal-assisted walking device that uses electronic motors and sensors to help children stand and walk more easily.